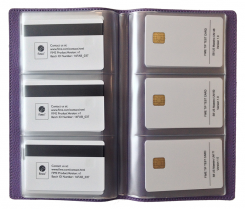 CDET test cards for Visa acquirer device compliance testing (contact). Configured in accordance with Visa requirements and best practices prior to deployment. Capable of successfully processing specific card personalization attributes that have been known to result in acceptance issues. CDET is a Visa Confirmed Test Tool. It can be used for Visa certification testing of any type of contactless terminal, POS or ATM. The card-terminal transaction logs are simply retrieved using card log software and a PC/SC reader.